We have all read in our science books that proteins are the building blocks of life. Every cell in the human body contains protein. The basic structure of protein is a chain of amino acids. Your body needs protein to help repair cells and make new ones. Protein is also important for growth and development in children, teens, and pregnant women. Protein comes from a variety of sources, including meat, milk, fish, soy, and eggs, as well beans, legumes, and nut butters. When proteins are digested, they leave behind amino acids, which the human body needs to break down food. Whey, a high quality protein source naturally found in milk, is a complete protein and contains all of the amino acids your body needs. In general, proteins derived from animal sources (i.e. milk, eggs & meat) are complete, but your body’s ability to use the protein varies. Consuming a higher protein diet is also a major part of losing weight. Protein helps regulate appetite and cravings by enhancing the feeling of fullness for longer after a meal or snack. This means that you have less chance of giving in to cravings so it is easier to keep your calories lower. To be able to lose weight you need to be in a calorie deficit (burn more calories than you consume). That’s where the feeling of being fuller for longer plays a big part. If you want to build and maintain muscle mass, you need to eat enough dietary protein. But did you know that distributing protein consumption throughout the day may be the most efficient way to build muscle? Whether you’re an athlete looking to bulk up, or just someone interested in maintaining muscle as you age, to build and maintain muscle over time it may be more effective to aim for around 30 grams of protein per meal three times a day. Branch chain amino acids are made up of 3 essential amino acids: leucine, isoleucine and valine. These are essential amino acids because your body can’t produce them therefore they need to be consumed. BCAA’s play an important part in energy production during exercise. This is why so many people drink BCAA supplements during their workouts. I myself do this to help recovery and to help me push out those extra reps. Here are 7 reasons why it is so important no matter what your goal, to have BCAA’s. Enhance Protein Synthesis- this helps for greater muscle growth and the maintenance of lean muscle mass during times off exercise. Support hormone balance during intense training- this helps for greater strength, power and endurance adaptations for intense training. May improve strength developments with training- this can improve neuromuscular adaptations. Enhance endurance performance and decrease fatigue- BCAA’s can be burned as energy to reduce fatigue and increase energy (drink BCAA’s during your workouts). Decrease muscle soreness & Delayed onset muscle soreness(DOMS) for greater training frequency- using BCAA’s to decrease soreness and accelerate recovery will allow you to train more frequently. Prevent muscular loss during long duration exercise- replenishes energy store. So as you have seen, supplementation plays a major part in reaching your goal whether it is to lose weight, put on muscle or just increase general fitness. 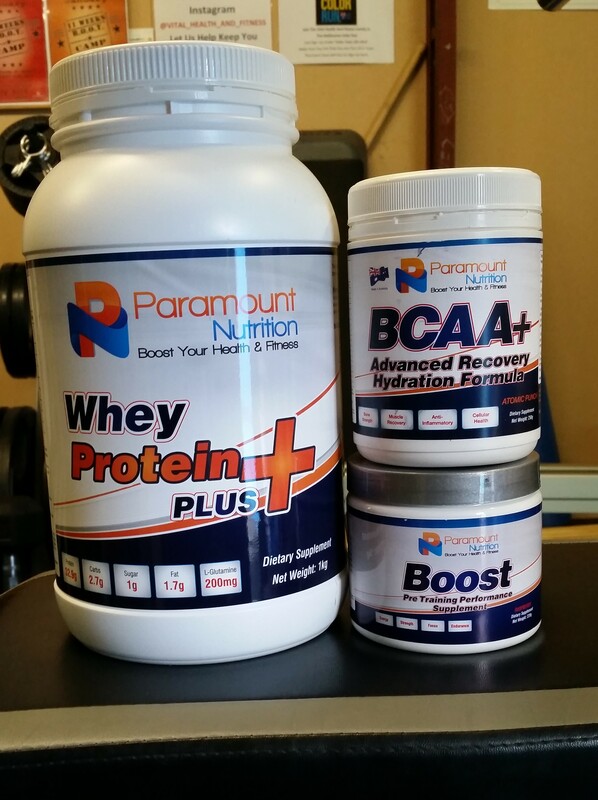 We are pleased to announce that we stock protein, BACC’s and preworkouts from Paramount Nutrition. These supplements are made of the highest quality ingredients. I myself use these products and have seen and felt great changes in my body and energy levels. A lot of the Vital Health and Fitness family have also been using these products and have seen some amazing results. Are you using supplementation? Give your body the extra help it needs and start using these amazing products.